Posters are designed to succinctly convey any important message in an art way and attract the attention of a target group or make the masses aware of some information over hundreds of years. They are usually used for a variety of purposes. For example, posters are a frequent tool of advertisers, propagandists, protestors and any other groups trying to communicate a message. They are also used for reproductions of artwork particularly famous works. Therefore, many posters have become extremely collectible. Ever wanted to add your own photos onto a pretty poster and make yourself like a popular star? 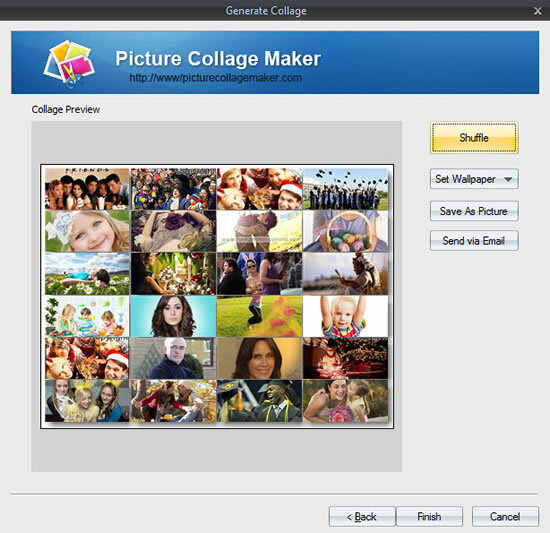 Here, Picture Collage Maker Pro comes with abundant of gorgeous templates and smart-fit features, which are all ready to help you make a poster with your own photos in minutes and realize your great dream. Let’s start to free download it and check the following steps on how to customize a poster in two different ways. 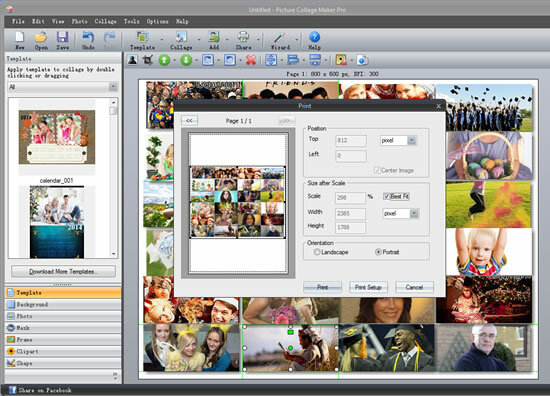 The first way is to choose Template Collage Wizard after you launch this powerful collage maker. Click Add Photos or Add Folder to add your pretty photos from local disk to Photo List. You can respectively preview them in the Photo Preview part. If necessary, click Remove button to remove some photos that you want to use another better photos to replace them. 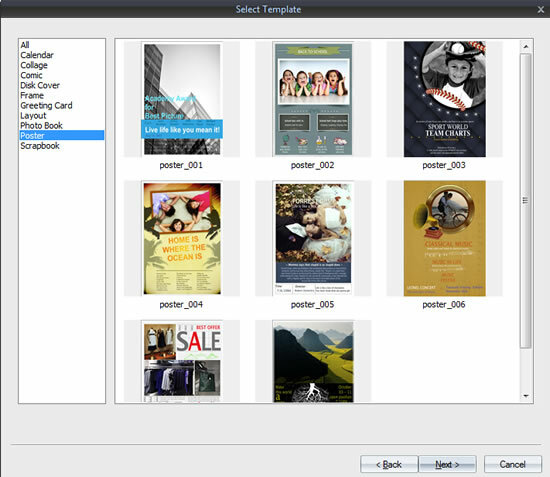 Once you have added all photos you want to apply, you can click Next and begin to select a template for your poster. A variety of beautifully and professionally designed poster templates can help you find great inspiration on customizing your artwork. Click Shuffle button to automatically change pictures. Here you can directly save your poster as picture, send it to your friends via email or set it as wallpaper according to your own basic needs. After clicking Finish button, you can edit your photos in the main program. Free to resize, rotate and add text, etc. Click Add →Add Text button to type any information you want to express. You can set font size, color and type at will. 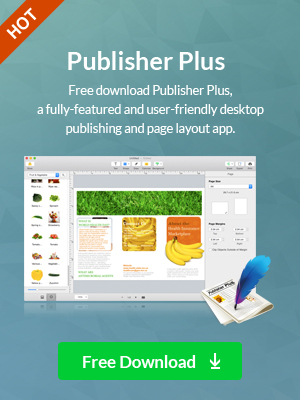 Click File → Print button to directly print your finished work out. Also, you can preview it first and then print it out if you get your last satisfaction. 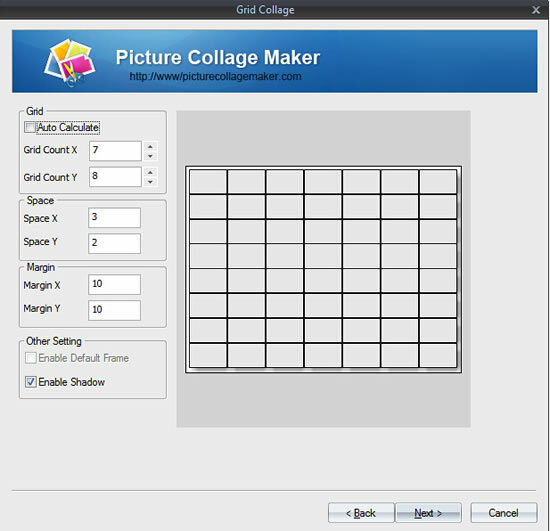 The second way is to choose Grid Collage Wizard and then start making your own poster. 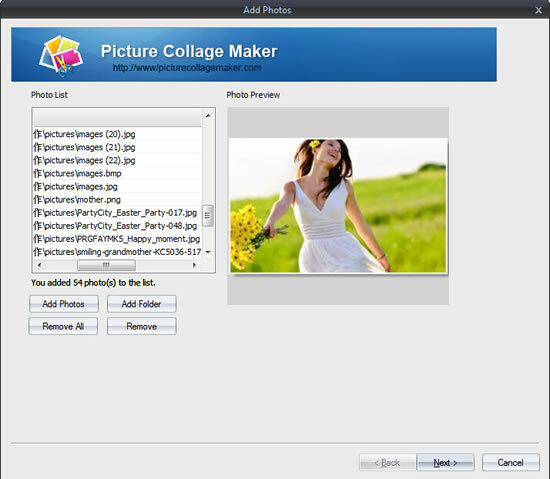 Add photos or folder from local disk by simply clicking Add Photos or Add Folder. You can also respectively preview them in the Photo Preview part. 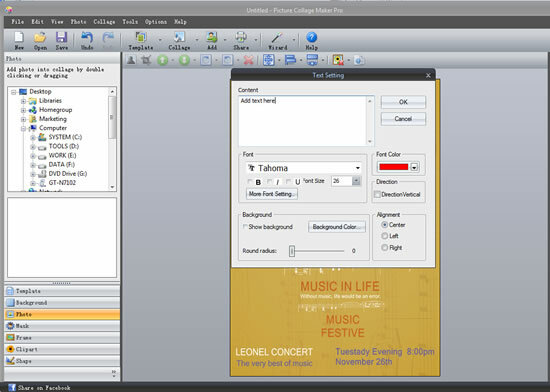 Free to customize your poster layout by setting Grid Count, Space and Margin. If necessary, you can make Other settings just by clicking Enable Default Frame or Enable Shadow. 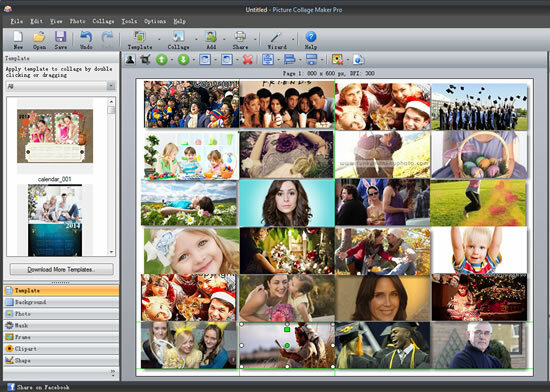 Click Shuffle button and then all the photos you select in the first step will fill in this page automatically. You can set your poster as wallpaper, save it as picture or send it to you loved ones via email. 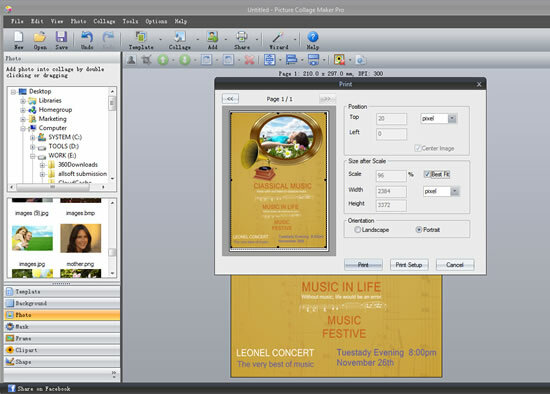 If the photos generated in step 3 can’t meet all your needs, you can adjust their position or resize them manually in the main program until you get your last satisfaction. 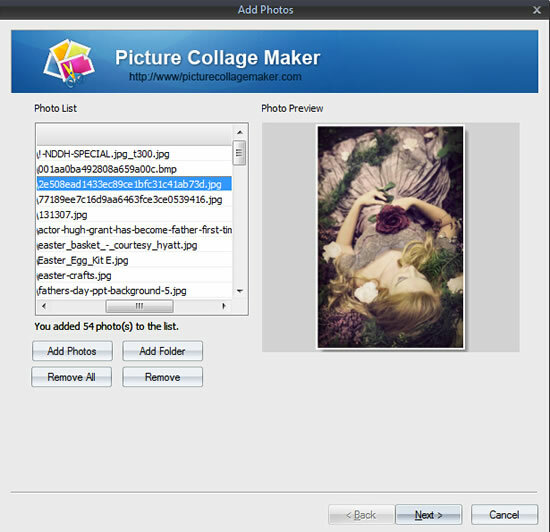 Click File → Print button to directly print your artwork out and then send it to your family members or closed friends. In addition, you can preview it first and then make some print settings such as Position, Size and Orientation according to your personal needs. A personalized poster has finished in two different ways with simple steps. Can’t wait to customize a beautiful poster with your own photos? Just do it now. 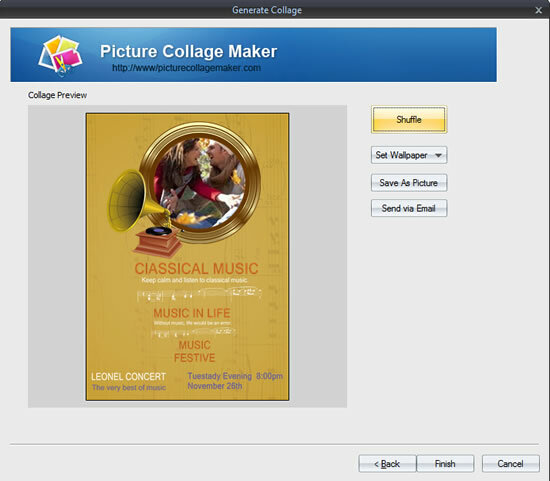 Picture Collage Maker Pro, an easy-to-use photo collage maker, will help you make a marvelous poster in minutes.